Agricultural technology corporations, like Monsanto, continue to push the notion that the use of GMO seeds will reduce the need for toxic chemicals in farming. Yet, in the past 5 years, due to the development of weed-resistant crops – farmers have been required to spray more herbicides on their fields – in an effort to kill the weeds. This is having a devastating effect on our environment and human health. 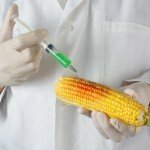 In fact, the only people who stand to gain from GMO technology are the companies that own the seeds and the chemicals used on the crops generated from these genetically manipulated seeds. Think about it – if GMO seeds are supposed to reduce the need for toxic chemicals – why are we seeing such a growth in glyphosate sales? According to a new market report published by Transparency Market Research, the global glyphosate herbicide market was valued, in 2012, at $5.46 billion and they expect the market to grow to $8.79 billion by 2019. In the past 5 years, we now see this toxic substance, glyphosate, in air and water samples plus within the blood of unborn children. Something is terribly wrong with this picture – don’t you think?